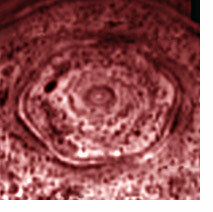 Shortly after the release of The Rosslyn Motet in 2005 and 5 year's of research into Cymatics and geometry, our attention was alerted to a magnificent geometric structure existing at the North Pole of the Planet Saturn. A perfect Hexagonal structure spanning 40,000 km wide (four Earths side by side) which was originally photographed by the NASA Voyager Space Probe in the 80's and more recently by NASA's Cassini mission. 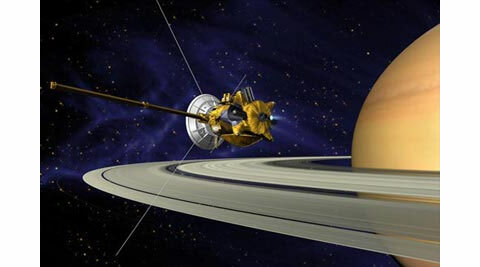 Surprisingly, the NASA scientists have no reasonable or definitive explanation for this phenomenon which has now existed for over 3 decades, perhaps even longer before Voyager arrived in the Saturn System in the 1980's. The reason for the scientist's inability to explain the Hexagon's presence is now understood by the fact that Cymatics, in its current Scientific status, has no mathematics calculated that explain its functions and effects. Therefore, scientists cannot agree upon the phenomenon of Cymatics as a ‘direct and calculable science' until they have the correct maths & equations to work with. Unfortunately Cymatic mathematics is in a constant flux of change due to the fact the math changes under different materials and conditions. This ultimately makes it impossible (at the moment) for scientists to apply Cymatics as a system theory into any current mediums by having no calculations to compare and apply them to. 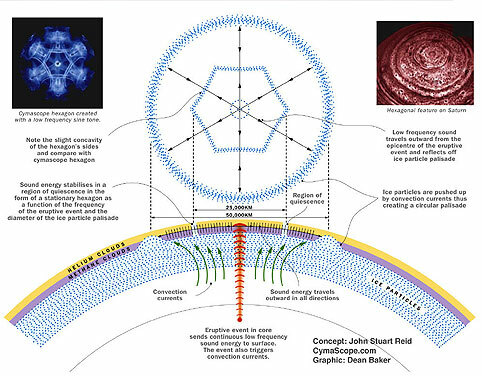 However, it should not be long before science and researchers like John Reid and various other scientists in the field of Cymatics have the mathematical formula to describe its incredible geometric presence and effects as an application to describe such objects as the Great Saturn Hexagon. Cymatics was explored by Jenny in his 1967 book, Kymatik (translated Cymatics). Inspired by systems theory, the work of Ernst Chladni, and his medical practice, Jenny began an investigation of periodic phenomena but especially the visual display of sound. He used standing waves, piezoelectric amplifiers, and other methods and materials. A simple experiment demonstrating the visualisation of cymatics can be done by sprinkling sand on a metal plate and vibrating the plate, for example by drawing a violin bow along the edge, the sand will then form itself into standing wave patterns such as simple concentric circles. The higher the frequency, the more complex the shapes produced, with certain shapes having similarities to traditional mandala designs. Standing waves are also observed in physical media such as strings and columns of air. Any waves travelling along the medium will reflect back when they reach the end. This effect is most noticeable in musical instruments where, at various multiples of a string or air column's natural frequency, a standing wave is created, allowing harmonics to be identified. One thing is universally agreed...The phenomenon IS geometric! 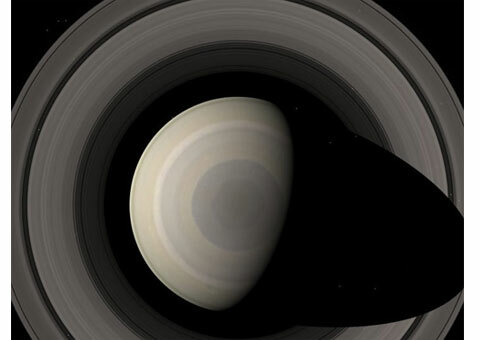 Seeing is believing and although the actual maths is not there to apply to it, the only valid explanation for its huge presence on Saturn is to compare it to our current understanding of Cymatics. I personally believe that this is exactly the same system that Cymatics is governed by and we are experiencing this effect on a planetary, cosmological scale, the harmonic relationships of The Music of the Spheres. My father and I believe we are currently observing the grandest Cymatics/Chladni pattern ever witnessed. The entire mechanics and physics are the same on this level of life as it is on a planetary scale resulting in the production of a geometric figure relative to its current frequency and amplitude. It is interesting to consider that if the geometric figure in Rosslyn Chapel is produced by the same principals as is happening on Saturn, vibration and sound, then Saturn is literally 'Singing' a piece of music to the cosmos. I think the following words by Johannes Kepler sum up the idea that vibration and sound underpin all levels of life on every scale. Even without the mathematics involved, sound and vibration seems to be the cause and effect of all natural phenomena that occur in our beautiful and musical universe.